So, what are the DON'Ts? Send follow-up text messages with changes in event details of a previously declined event (by agency rep) - ang kulit!!! Send text message of the event with a different time to different bloggers. Send last minute text message about changes on the day of the event. 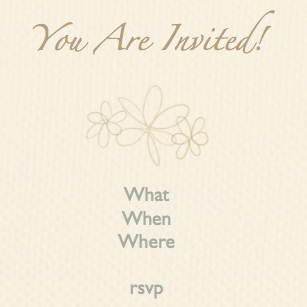 Send an invitation addressed to a different person* (Additional DON'T*) - Thanks to blogger Pehpot for leaving a comment and reminding me about this! I'm sure there are more DON'Ts when it comes to inviting guests to events. I just came up this list of ways that I believe a company (client) or event organizer / PR agency can FAIL in inviting a blogger like myself. And yes, I've experience all of the above in the past from different organizers. So if you want to turn-off guests (bloggers), just do any of the above. This random post today is for all my blogger friends, clients, and organizers - hoping we can all learn from this, and learn to respect each other when it comes to these activities. But this is mainly because of a very recent event I was invited to, with the date changed twice (or thrice...I can't recall anymore). Would you believe that most of the items on this list were committed by just one (1) agency that I have not even heard off until 2 months ago, for what I believe was their first attempt at having bloggers to an event? What really pissed me off was what the organizer did to me - see #13 & #14! On a side note, I was an event organizer myself so I expect professionalism from anyone that invites me. I also expect the venue to be set up before guests arrive, and not while the guests are already at the venue (which also happened to this particular event I'm talking about, as shared to me by one of the bloggers who attended). Organizers should be ready at the venue with all the materials and presentation equipment at least 1 hour before the time specified on the invitation. Since it's really an effort for me to attend events, and my time is really calculated when I do, I hate it when I arrive on time and not one representative from the organizer is present to usher in guests, and program starts more than 30 minutes after time of invite. I think I never ranted like this on my blog before, but it just blew my top off when I learned that my name was used by people who don't know how to do their jobs professionally. Whatever happens, the end-result will reflect on the brand, regardless of who did the actual inviting. I'll stop here. Thank you for indulging me. If you have similar experiences, do share!